1. Department of Stem Cell Disorders, Kansai Medical University, Hirakata City, Osaka, Japan. 2. Department of Cardiac Surgery, Beijing Institute of Heart, Lung and Blood Vessel Disease, Beijing Anzhen Hospital Affiliated to Capital Medical University, Beijing, China. 3. Department of Drug Science, Section of Biochemistry, University of Catania, Catania, Italy. 4. Department of Biotechnology, Kyoto Institute of Technology, Kyoto, Japan. 5. Division of Surgical Pathology, Toyooka Hospital, Hyogo, Japan. Nonalcoholic fatty liver disease (NAFLD) is associated with insulin resistance, oxidative stress, and obesity. The db/db mouse model displays increased levels of insulin resistance, obesity, and an over-accumulation of hepatic triglycerides, making it an excellent model for studying NAFLD. In db/db mice, intra-bone marrow-bone marrow transplantation plus thymus transplantation (IBM-BMT+TT) improves type 2 diabetes mellitus (T2 DM) by normalizing the T-cell imbalance. We hypothesized that this approach would improve Sirt1 expression in the liver and benefit liver development. The db/db mice were treated with IBM-BMT+TT, and plasma MCP-1, IL-6, adiponection, LDL, Sirt1, and HO-1 levels were then assessed. Stem cell transplantation decreased the levels of plasma inflammatory cytokines and LDL while it increased the expression of Sirt1 and HO-1, resulting in decreased progression of fatty liver. Moreover, Sirt1 and HO-1 expression were both detected in the thymus and many HO-1-positive cells were observed in the bone marrow. This is the first report of stem cell transplantation improving the antioxidant function in the liver, thymus, and bone marrow of db/db mice by increasing the levels of Sirt1 and HO-1. This approach may prove useful in the treatment of nonalcoholic steatohepatitis and its clinical manifestations. 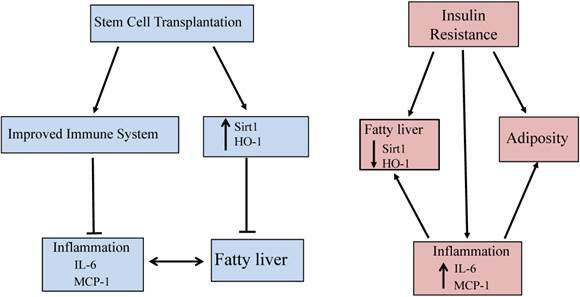 Keywords: stem cell transplantation, Sirt1, HO-1, nonalcoholic fatty liver disease, obesity. Nonalcoholic fatty liver disease (NAFLD) is a term used to describe a gamut of liver diseases, beginning with increased fat deposition in the liver, and having the potential to progress towards steatohepatitis or even cirrhosis. Along with the potential for irreversible liver damage, NAFLD is the most common cause of chronic liver disease not due to alcohol or hepatitis. The metabolic derangements caused by NAFLD are associated with insulin resistance, oxidative stress, and obesity . Insulin resistance results in the impaired suppression of lipolysis in adipose tissue and increased levels of circulating non-esterified or free fatty acids (FFA). An excess of saturated FFAs overwhelms the capacity of the liver to esterify them, which induces lipotoxicity. Circulating FFAs derived from adipose tissue lipolysis play a critical role in the development of steatosis in NAFLD, contributing up to 60% of hepatic fat content . During the development of obesity, expansion of adipose tissue results in activation of the death receptor and mitochondrial pathways of apoptosis in adipose tissue. 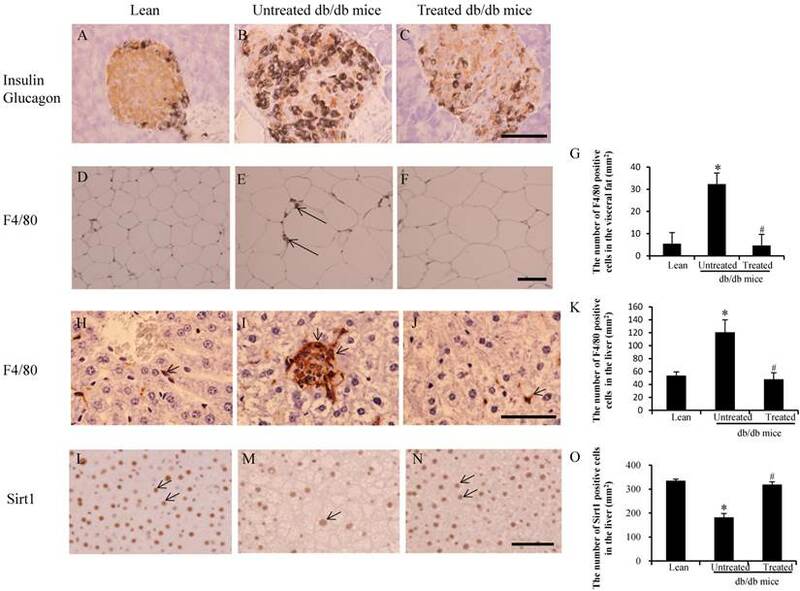 An increase in the death of adipocytes results in the recruitment of macrophages to adipose tissue, with the subsequent development of insulin resistance and hepatic steatosis . Oxidative stress, due to increased production of reactive oxygen species (ROS) and decreased antioxidant defense, is observed in both human and experimental models of steatohepatitis . Elevated HO-1 levels increase cellular antioxidant capabilities by increasing ferritin, carbon monoxide (CO) and bilirubin, leading to increased insulin sensitivity [5, 6]. The protective role of HO-1 against the development of diabetes and metabolic syndrome is well known; it interrupts the progression of steatohepatitis by upregulating antioxidant chaperones, enzymes, and anti-inflammatory markers such as IL-22, while conversely downregulating proinflammatory cytokines . Thus, the induction of HO-1 downregulates fibrotic genes, ameliorates fibrosing hepatitis , and suppresses hepatocyte apoptosis . Sirt1 is a class III protein deacetylase, a crucial cellular survival protein against oxidative stress. It regulates glucose-lipid metabolism through its deacetylase activity and has both direct and indirect involvement in insulin signaling in insulin-sensitive organs such as adipose tissue, liver and skeletal muscle. The activation of Sirt1 ameliorates fatty liver by reducing the expression of lipogenic enzymes in monosodium glutamate-treated mice . Our previous study demonstrated that intra-bone marrow-bone marrow transplantation combined with thymus transplantation (IBM-BMT+TT) normalized T cell subsets, cytokine imbalances, and insulin sensitivity in db/db mice by enhancing the expression of pAKT, pLKB1, pAMPK, and HO-1 . However, it was unclear how the expression of Sirt1 in the fatty liver was regulated by this approach. 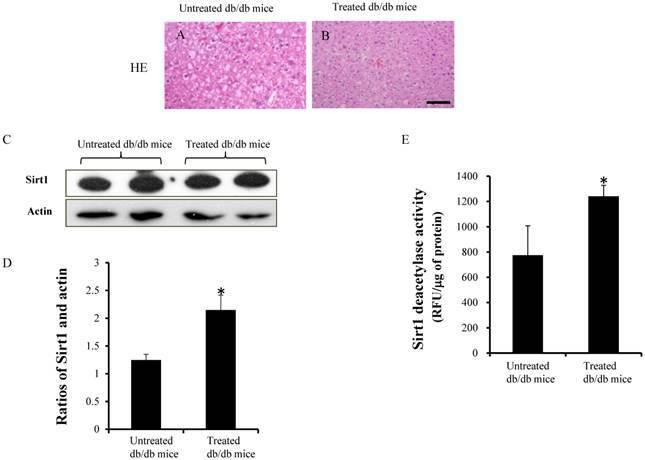 In this paper, we show that stem cell transplantation increases Sirt1 and HO-1 expression, with a resultant improvement in metabolic function in the fatty liver of db/db mice. Five-week-old male db/db and lean mice were purchased from Charles River Laboratories (Yokohama, Japan), and male C57BL/6 (B6) mice were purchased from SLC (Shizuoka, Japan). All procedures were according to our previous report . The same experiment was repeated three times (n=6 in each group). Stem cell transplantation, insulin tolerance test and insulin measurements were carried out as in our previous report . MCP-1 and leptin were determined in mouse plasma using ELISA assay kits (R&D Systems, Inc., MN). LDL levels were measured according to the manufacturer's protocol using HDL and LDL/VLDL cholesterol assay kit (AbcamⓇ, UK). These experimental animals were followed up for 16 weeks after treatment. The pancreas, adipose tissue, thymus, and livers of the lean and db mice were removed 2 months after transplantation. The pancreata were stained with polyclonal guinea pig anti-swine insulin antibody (N1542, Dako Cytomation, CA) and monoclonal rabbit anti-human glucagon (8233s, Cell Signaling Technology, Massachusetts). The adipose tissue was stained with F4/80 antibody (AbD Serotec, Oxford, UK). The livers were stained with hematoxylin and eosin (HE), anti-Sirt1 antibody (AbcamⓇ), F4/80 antibody, and anti-HO-1 antibody (AbcamⓇ). The thymi were stained with anti-cytokeratin 5 (CK5) antibody (AbcamⓇ), Sirt1 antibody, and HO-1 antibody. The bone marrow was stained with anti-HO-1 antibody. The stained sections were examined under an Olympus microscope (Olympus, Japan). HO-1 and Sirt1-positive cells in the liver of each group were calculated using software (Image-pro plus) for Windows. At sacrifice, livers were dissected, pooled for each mouse and used to measure Sirt1. Specimens were stored at -80°C until assayed. The lysates from the liver tissues were subjected to sodium dodecylsulfate-polyacrylamide gel electrophoresis (SDS-PAGE) and electroblotted onto poly (vinylidene difluoride) (PVDF) membrane (Bio-Rad Laboratories, Hercules, CA). Immunoblotting was carried out with antibodies for Sirt1 (AbcamⓇ) and actin (BML, Tokyo, Japan) as the primary antibodies. Sirt1 deacetylase activity was measured according to the manufacturer's protocol using Sirt1 activity assay kit (AbcamⓇ). Sirt1 deacetylase activity was normalized by protein content. TEC isolation and the RT-PCR method were performed as previously described . The CD45-negative cells were isolated for Real-Time PCR. Fisher method of analysis was used to determine statistical significance. A single-factor ANOVA or unpaired t test was used to test the null hypothesis for comparing experiment groups. P value <0.05 was considered as statistical significance. Both leptin and adiponectin are produced from adipocytes. The ratio of plasma leptin and adiponectin was higher in the untreated db/db mice when compared with age-matched lean mice, but decreased after stem cell treatment (*,#p< 0.05) (Fig. 1A). Plasma MCP-1 was 2.2 times higher in the untreated db/db mice when compared with lean mice, but decreased after treatment (*,#p< 0.05) (Fig.1B). LDL levels were increased in db/db mice when compared to age matched lean mice (0.72±0.04 vs 0.3±0.03µg/µl, *p<0.05). Stem cell transplantation treatment decreased LDL levels in the db/db mice compared to untreated db/db mice (0.48±0.08 vs 0.72±0.04µg/µl, #p<0.05)(Fig 1C). 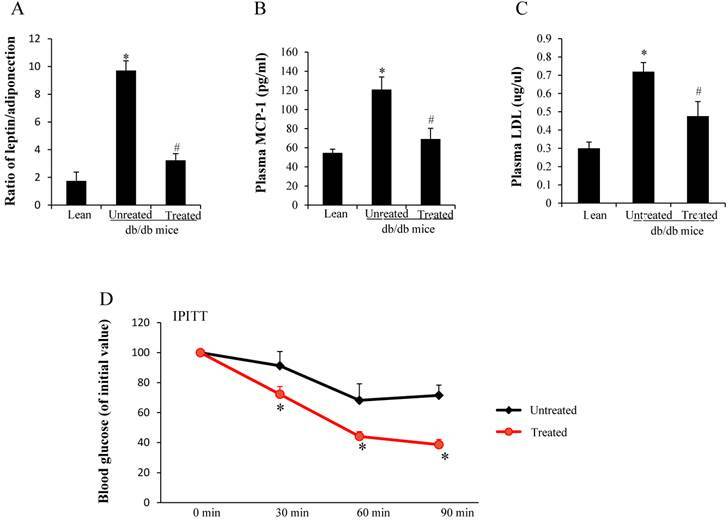 We performed the intraperitoneal insulin tolerance test to estimate insulin resistance, and the results showed severe insulin resistance in the untreated db mice. Treated db/db mice exhibited a rapid decline in BG after insulin was administered (Fig.1D), suggesting improved insulin sensitivity after the treatment. BG levels (percentage of initial value) at all time points in the treated db/db mice were lower than those in the untreated db/db mice (*p<0.05). Insulin and glucagon double staining was used to estimate islets. There were far fewer insulin-positive cells (brown color) in the larger pancreatic islets of untreated db/db mice (Fig. 2B) than in those of lean mice (Fig. 2A). However, there was increased insulin content in the residual beta cells (Fig. 2C) of the treated db/db mice, suggesting that beta cell destruction could be prevented by stem cell transplantation. Analysis of cytokine production and insulin resistance. (A) Ratio of leptin and adiponectin (*,#p< 0.05). (B) Plasma MCP-1 levels (#,*p<0.01) (C) Plasma LDL levels (#,*p<0.05). *significant with respect to untreated versus lean mice. # significant with respect to treated versus untreated mice. (D) Profiles of BG levels (percentage of initial value) after insulin administration (*p<0.05). The results are mean±SE, n=7 in each group. Imaging analysis in the pancreas, adipose tissue and livers. (A-C) Immunochemistry staining for insulin (brown ) and glucagon (black). There was considerably more insulin content in residual beta cells (brown color in C) when compared to untreated db/db mice (B). (D-F) Immunostaining for F4/80 in visceral fat. F4/80-positive cells (arrows in E) were observed in untreated db/db mice. (G) The low F4/80-positive cells counts were improved after stem cell transplantation. (H-J) More F/80-positive cells were detected in the untreated db/db mice (arrows in I) than lean (arrow in H) and treated db/db mice (arrow in J). (K) The number of F4/80 positive cells in the liver. The high F4/80-positive cell counts were improved after stem cell transplantation. (L-N) Expression of Sirt1 decreased more in the liver of untreated db/db mice (arrow in M) than lean (arrows in L) and treated db/db mice (arrows in N). (O) The number of Sirt1-positive cells in the liver. Decreased numbers of Sirt1-positive cells were improved after stem cell transplantation. The results are mean±SE, n=7 in each group. Scale bar =25µm. *significant with respect to untreated versus lean mice. #significant with respect to treated versus untreated mice. An increased number of F4/80-positive cells in the visceral fat were observed in the untreated db/db mice (arrows in Fig.2E) when compared with the lean (Fig.2D) and treated mice (Fig.2F). The number of F4/80-positive cells in the untreated db/db mice was higher than in the lean mice (32±5/mm2 vs 6±1/ mm2, *p<0.05), and the number in the treated db/db mice was lower than in the untreated db/db mice (4±2/ mm2 vs 32±5/mm2 #p<0.05) (Fig.2G). Similarly, a greater number of F4/80-positive cells were observed in untreated db/db mice (arrows in Fig.2I) than in both lean (Fig.2H) and treated mice (Fig.2J). The number of F4/80 positive cells in the untreated db/db mice was higher than in the lean mice (121±19/mm2 vs 54±6/ mm2, *p<0.05), and the number in the treated db/db mice was lower than in the untreated db/db mice (48±10/ mm2 vs 121±19/mm2 #p<0.05) (Fig.2K). Sirt1-positive cells were also observed in the liver of lean mice (arrows in Fig.2L) and treated db/db mice (arrows in Fig.2N), but there were fewer Sirt1-positive cells in the untreated db/db mice (arrows in Fig.2M). 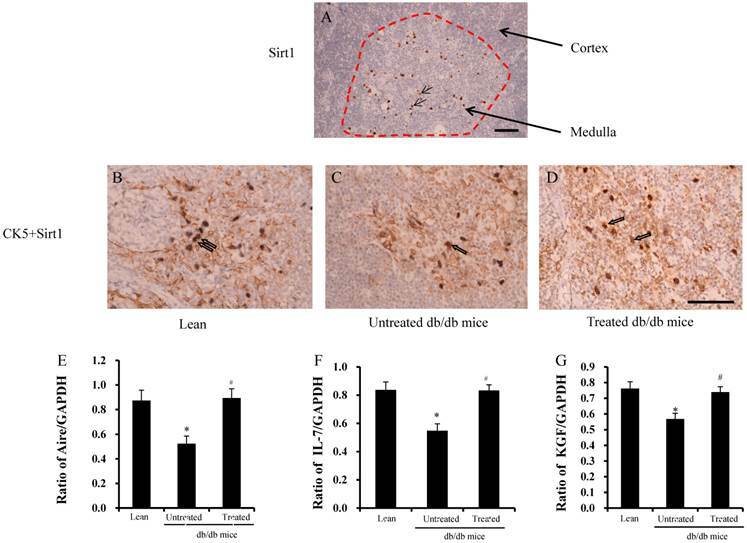 The number of Sirt1 positive cells in the untreated db/db mice was lower than in the lean mice (183±16/mm2 vs 335±7/ mm2, *p<0.05), and the number in the treated db/db mice was higher than in the untreated db/db mice (319±12/ mm2 vs 183±16/mm2 #p<0.05) (Fig.2O). Immunostaining was carried out with a specific antibody against the murine HO-1 in hepatocytes. 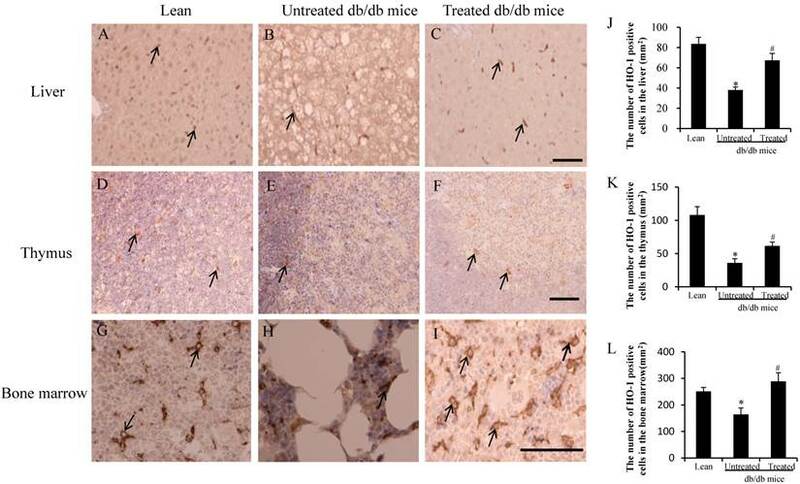 HO-1-positive cells were observed in the liver of the lean mice (arrows in Fig.3A) and the treated db/db mice (arrows in Fig.3C), but fewer HO-1-positive cells were observed in the untreated db/db mice (arrows in Fig.3B). The db/db mice exhibited a marked reduction in the size and cellularity of the thymus [14, 15]. HO-1 positive cells were observed in the thymus of the lean mice (arrows in Fig.3D) and treated db/db mice (arrows in Fig.3F), but fewer HO-1-positive cells were observed in the untreated db/db mice (arrows in Fig.3E). HO-1-positive cells were also observed in the bone marrow of lean mice (arrows in Fig.3G) and treated db/db mice (arrows in Fig.3I), but fewer HO-1-positive cells were observed in the untreated db/db mice (arrows in Fig.3H). The number of HO-1 positive cells per mm2 was calculated, and the number in the liver of the untreated db/db mice was lower than in the lean mice (38±3/mm2 vs 84±6/mm2, *p<0.05), while the number in the treated db/db mice was higher than in the untreated db/db mice (67±7/mm2 vs 38±3/mm2,# p<0.05) (Fig. 3J). Similarly, the number of HO-1 positive cells in the thymus of the untreated db/db mice was lower than in the lean mice (36±6/mm2 vs 108±12/mm2, *p<0.05), while in treated db/db mice, the HO-1-positive cell number was higher than in the untreated db/db mice (62±6/mm2 vs 36±6/mm2, #p<0.05) (Fig.3K). The number in the bone marrow of the untreated db/db mice was lower than in the lean mice (165±24/mm2 vs 252±14/mm2, *p<0.05), and the number in the treated db/db mice was higher than in the untreated db/db mice (289±32/mm2 vs 165±24/mm2, #p<0.05) (Fig.3L). Figure 4A and 4B shows the HE staining in the untreated and treated db/db mice. The expression of Sirt1 and actin were detected by western blotting (Fig.4C). Densitometry analyses showed significant increases in the ratios of Sirt1 in the treated db/db mice (Fig.4D) (1.24±0.1 vs 2.1±0.3, p<0.05). Sirt1 deacetylase activity, which is expressed in relative fluorescence units (RFU), was significantly higher in the treated db/db mice than untreated db/db mice (Fig.4E) (1241±87.1vs 775±232.6 RFU/μg of protein, p<0.05). Sirt1 was stained in the thymus, and Sirt1 expression was found only in the medulla, not in the cortex (red area in Fig.5A). CK5 is a marker of medulla thymic epithelial cells (mTECs) and Sirt1 was found in the mTECs (Fig.5B-D), not in cortical TECs (cTECs). The ratios of Aire, IL-7, and KGF in TECs are shown in Fig. 5E-G. The ratios were significantly lower in the untreated db/db mice than lean mice, but were improved significantly after treatment. Analysis of HO-1 in the liver, thymus and bone marrow. (A-I) Expression of HO-1 was lower in the liver (arrow in B), thymus (arrow in E) and bone marrow (arrow in H) in db/db mice than lean mice (arrow in A, D and G). Improved expression of HO-1-positive cells was detected in the liver (arrows in C), thymus (arrows in F) and bone marrow (arrows in I) of treated db/db mice. (J-L) The number of HO-1-positive cells in the liver, thymus and bone marrow. The low HO-1-positive cell counts were improved after stem cell transplantation. The results are mean±SE, n=7 in each group. Scale bar =25µm. *significant with respect to untreated versus lean mice. #significant with respect to treated versus untreated mice. HE staining, results of western blotting and Sirt1 activity. (A and B) HE staining in the liver. (C)The expression of Sirt1 was measured by western blotting. (D) Ratio of Sirt1 and actin in the treated db/db mice was significantly higher than untreated db/db mice. (E) Sirt1 deacetylase activity increased significantly in the treated db/db mice but not in the untreated db/db mice. Scale bar =25µm. *significant with respect to treated versus untreated db/db mice. Analysis of Sirt1 expression in the TEC. (A) Expression of Sirt1 only detected in the medulla of thymus (arrows in the red circle). (B-D) mTEC- specific CK5 and Sirt1 double-positive cells were detected in the medulla of the thymus (arrows in B-D). (G-E) Ratios of Aire, IL-7 and KGF by RT-PCR were found to be significantly lower in the db/db mice than lean mice. These ratios were improved significantly after treatment. Scale bar =25µm. *significant with respect to untreated versus lean mice. #significant with respect to treated versus untreated mice. Sirt1 is involved in a variety of diseases, including diabetes, cardiovascular disease, cancer, neurodegenerative disease and inflammation in general. Sirt1 regulates insulin secretion, adiponectin production, inflammation, gluconeogenesis, and oxidative stress, all of which contribute to the development of insulin resistance . Our previous study showed that, in db/db mice, stem cell transplantation upregulates the expression of HO-1 and induces adiponectin secretion, followed by enhanced pLKB1-AKT- AMP-activated protein kinase (AMPK) crosstalk, with improvement both in inflammation and hyperglycemia . AMPK activates Sirt1, resulting in the enhanced ability of peroxisome proliferator-activated receptor-gamma coactivator-1(PGC-1α) to stimulate mitochodrial biogenesis and function. Sirt1 also activates LKB1, which in turn activates AMPK, decreasing susceptibility to metabolic syndrome-associated disorders . Moreover, pre-adipocytes over-expressing Sirt1 displayed not only reduced adipogenesis in vitro, resulting in the prevention of adipocyte hypertrophy, but also the down-regulation of adipogenic regulators such as PPARγ and C/EBPα [18, 19]. This suggests that adipogenesis is dependent on the levels of Sirt1. In addition, HO-1 increased FGF21 expression, glycogen content, and decreased PGC-1α, resulting in a decrease in fatty liver . Futhermore, HO-1 increases pAMPK/AKT expression and decreases adiposity in obese mice . HO-1 also attenuates adiposity and vascularity resulting from decreases in fatty acid synthesis . These results showed that stem cell transplantation upregulated HO-1 and AMPK, and increased the expression of Sirt1, which had a positive effect on fatty liver. This suggests that normal physiological processes could be restored by increasing the levels of Sirt1 and HO-1 expression. Obesity-induced inflammation is an important regulator of adipocyte function and insulin sensitivity. The db/db mouse model has higher liver weights, hepatic TG content, and lipogenic markers, including increased hepatic gene expression and protein content of acetyl-Co-A carboxylase, fatty acid synthase, PPARγ and SREBP-1c compared with wild type mice . Under conditions of obesity and insulin resistance, hepatic influx of FFAs increased, resulting in β-oxidation or etherification with glycerol to form triglycerides, leading to fat accumulation in the hepatocytes. FFAs are toxic to hepatocytes due to their ability to increase both oxidative stress and active inflammatory pathways . Adipokines such as adiponectin, leptin, and resistin, along with cytokines such as TNFα, IL-6, and IL-1, play key functions in the progression of steatosis to fibrosis . Cytokines are involved in the recruitment of circulating macrophages into the liver and the activation of Kupffer cells and hepatic stellate cells, both being factors that contribute to the progression from simple steatosis to steatohepatitis . Our results show that, in db/db mice, elevated plasma insulin, MCP-1, and IL-6 levels, as well as decreased adiponectin levels, were improved after stem cell transplantation. After treatment, the inflammatory cytokines were reduced to about 60% the levels of those in the untreated db/db mice. Oxidative stress is manifested by the imbalance between the formation of pro-oxidants such as ROS and/or reactive nitrogen species, and the production of antioxidant defenses. Decreased secretion of adiponectin by dysfunctional adipocytes contributes to steatohepatitis and fibrosis . Sirt1 maintains the integrity of hematopoietic cells through the elimination of ROS, FOXO activation, and p53 inhibition, suggesting that Sirt1 suppresses the differentiation of hematopoietic stem/progenitor cells . Sirt1 negatively regulates T-cell activation and plays a major role in clonal T-cell activity in mice. The loss of Sirt1 function results in increased T-cell activation and a breakdown of CD4 T-cell tolerance in vivo . However, it must be kept in mind that the observed increase in Sirt1 expression following stem cell transplantation is also likely due to a reduction in inflammation and expression of leptin receptor in the thymus and bone marrow. TECs are derived from the endodermal epithelium of the third pharyngeal pouch . Cortical TECs provide a microenvironment favorable to the generation of T-cells and the positive selection of functional, competent T-cells, whereas mTECs contribute to the establishment of self-tolerance by the deletion of self-reactive T-cells and the generation of regulatory T-cells. The nuclear protein Autoimmune regulator (Aire), expressed by a subpopulation of mTECs, is essential for the establishment of self-tolerance in T-cells during the perinatal period . We show here, for the first time, that Sirt1 expression occurs in mTECs, not in cTECs. Moreover, the relative ratios of Aire, IL-7, and KGF in the TECs improved after stem cell transplantation. Future studies will focus on the development of mTECs and their function using Sirt1 KO mice. Thus, increased Sirt1 expression, taken together with increased levels of HO-1 and adiponectin, along with a parallel reduction in pro-inflammatory cytokines and LDL levels after stem cell transplantation, indicates the potential of this approach to prevent increased levels of ROS and the development of fibrosis in this animal model of NAFLD. The thymus is a lymphoid organ in which T cells develop. Thymus transplantation has been used to treat immunodeficiency and other related diseases by correcting immune dysfunction [32, 33]. T lymphopenia and thymus dysfunction are independent of the development of insulin resistance . However, our previous study showed that stem cell transplantation normalized the percentages of double-positive, double-negative and CD4 cells in the thymus as well as normalized the CD4/CD8 ratios in the PB state. This resulted in decreased plasma IL-6 and IL-1α levels and increased plasma adiponectin levels, followed by improved insulin sensitivity, and improved expression of AKT and AMPK in the db/db mice . AMPK and Sirt1 dysfunction may induce altered lipid metabolism, insulin resistance, inflammation, and mitochondrial dysfunction, which then induces T2DM and NAFLD . Our studies suggest that stem cells may normalize immune dysfunction, upregulate HO-1and Sirt1, and benefit fatty liver in db/db mice. At present, it is unclear whether the activation of Sirt1 is effective for treating NAFLD clinically. But, in the case of metabolic disorders, activation of Sirt1 has demonstrated positive effects, including promoting lipid homeostasis, glycemic regulation, and mitochondrial function, as well as controlling inflammatory processes . Additionally, normalization of immune function may help increase the expression of HO-1 and Sirt1, suggesting the activation of HO-1 and Sirt1 may prove to be therapeutic targets in preventing the development of T2DM and NAFLD. This is the first report showing that stem cell transplantation decreases plasma LDL levels, increases the expression of Sirt1 and prevents fibrosis in the liver of db/db mice. Moreover, Sirt1 is expressed only in mTECs, not in cTECs. Thus, the demonstration that stem cells improve blood glucose levels and insulin function in db/db mice through increased HO-1 expression, upregulated Sirt1, and level of adiponectin, while decreasing the levels of inflammatory cytokines and LDL, offers a portal to a therapeutic approach in the treatment of NAFLD. Specifically, the elevated levels of these antioxidant enzymes after stem cell transplantation provides an insight into the mechanisms involved in metabolic syndrome and its related disorders with accompanying immune dysfunction. The increased expression of HO-1/Sirt1 may reprogram adipocyte stem cells and improve the level of inflammatory cytokines, since adipose tissue is as an endocrine organ and releases cytokines and adipokines . Figure 6 gives a brief illustrative summary of the effects that stem cell transplantation has on anti-oxidant enzymes, immune system function, and inflammation. NAFLD is the full spectrum of disease from fatty infiltration to steatohepatitis. Much attention has been focused on the identification of what causes fatty infiltration to progress to steatohepatitis in some individuals. While the explanation remains elusive, we have clearly identified a therapeutic target that prevents the progression of the disease, regardless of its etiology. In the meantime, stem cell transplantation offers an effective therapeutic approach in the treatment of NAFLD. Schemata of stem cell transplantation resulting in improved fatty liver in the diabetic mice. Stem cell transplantation improved expression of Sirt1 and HO-1 in the liver and thymus as well as improved immune system function. The effects are beneficial for attenuating fatty liver and decreasing inflammation. Aire: autoimmune regulator; AKT: Protein Kinase (Activator); AMPK: AMP-activated protein kinase; BG: blood glucose; BMC: bone marrow cells; CK5: cytokeratin 5; cTEC: cortical thymic epithelial cells; FFA: free fatty acid; FOXO: forkhead transcription factor O; HDL: high-density lipoprotein; HO-1: heme oxygenase isozyme 1, inducible form; IL-22: Interleukin 22; IL-6: Interleukin 6; KGF: keratinocyte growth factor; LKB1: Liver kinase B1; MCP-1: monocyte chemoattractant protein-1; mTEC: medulla thymic epithelial cells; NAFLD: Nonalcoholic fatty liver disease; pAKT: phosphorylated Protein Kinase (Activator); pAMPK: phosphorylated activated protein kinase; PB: peripheral blood; PBS: phosphate buffered saline; pLKB1: phosphorylated liver kinase B1; ROS: reactive oxygen species; Sirt1: silent information regulator 1; T2 DM: Type 2 diabetes mellitus; TEC: thymic epithelial cells; VLDL: very low-density lipoprotein. We would like to thank Mr. Hilary Eastwick-Field and Ms. Keiko Ando for their help in the preparation of the manuscript. We thank Dr. Stephen J. Peterson for his comments and editing. This work was mainly supported by Otsuka Pharmaceutical Company, Ltd. This work was also supported by National Natural Science of Foundation of China (81100177). Corresponding author: Susumu Ikehara, M.D., Ph.D., Department of Stem Cell Disorders, Kansai Medical University, Hirakata City, Osaka 573-1010, Japan. Telephone: 81-72-804-2450; Fax: 81-72-804-2454; e-mail: ikeharakmu.ac.jp.